Meditation Lab is a project by artist/designer/innovator Danielle Roberts. Here she works on applications in which technology supports spirituality in order to let people flourish and grow through insight and awareness. The latest project is Meditation Lab Experimenter Kit. This kit consists of a suit and software. 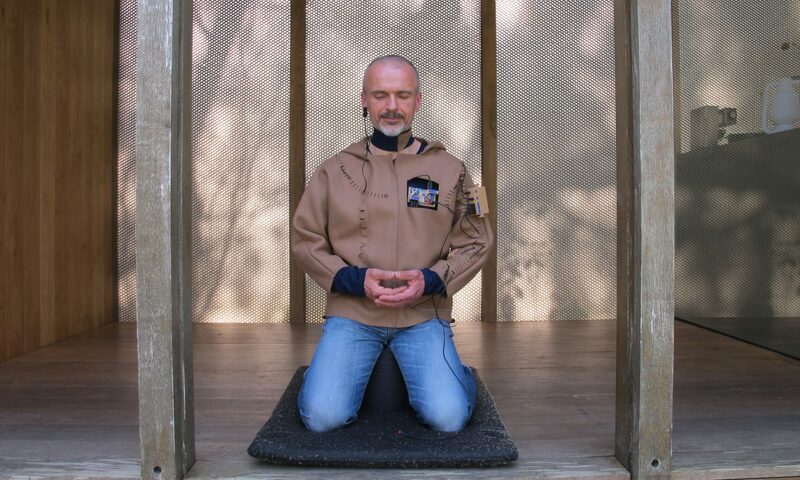 With the kit you can do your own meditation experiments. You can discover how to positively influence your meditation by changing your environment. Current wearables only measure some variables and often this data is neither complete nor freely available to users. Silence Suit is the first wearable that gives you a comprehensive picture of your physical condition and environmental factors during meditation. You have complete control over your data! The meditation suit Silence Suit houses 11 sensors which combined measure 18 parameters about your body and the environment. The suit has a wireless connection with the software belonging to it: the Dataserver. It logs, displays and analyses the data. The server is connected to a smart light unit which can change colour during the meditation session. Before and after every session you fill in a questionnaire. A learning algorithm will predict from your answers which type of light is most suitable for you. MLEK wants to grow into a community. Together we can further develop the suit and software and make new applications.